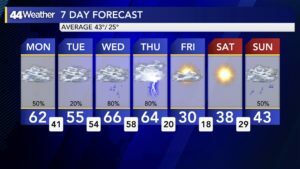 Even though the Colts, Titans, Bears, or my Eagles weren’t in the Super Bowl this year, Mother Nature came through in the clutch this past weekend. After dealing with subzero wind chills last week, temperatures soared into the upper 50s Saturday and mid to upper 60s under mostly sunny skies Sunday. Had to shut the heat off and open up the windows of my apartment. Good news is the unseasonably warm temperatures will continue as we start the first week of February. The bad news rain chances increase and potential flooding by mid to late week and then the return of winter-like temperatures. 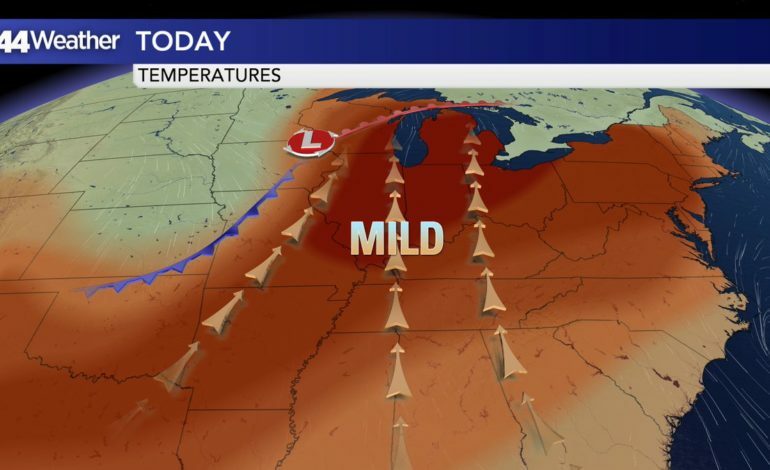 TODAY: Will feature mild and breezy conditions temperatures rising into the low to mid 60s, keep the umbrellas handy, scattered showers will move across the area as a cold front pushes through tonight. Rainfall totals with this first system will generally be on the light side, 0.15″-0.30″. TUESDAY: Behind the front, cooler weather but temperatures don’t drop off all that much, still above average with temperatures in the low to mid 50s under mostly cloudy skies. 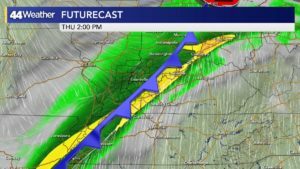 WEDNESDAY: A warm front will lift through the area, southerly winds return as temperatures go right back into the mid 60s, heavy rain develops by the afternoon and continues through the night. 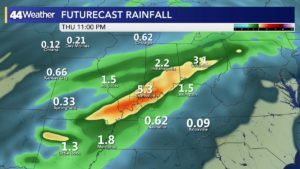 Rainfall totals will likely be 0.50″-2″ through Wednesday night. THURSDAY: Heavy rain continues, even a few thunderstorms can’t be ruled out by the afternoon and early evening hours, temperatures staying in the 60s as a strong cold front roles in Thursday night. Right now it looks like some isolated severe storms are possible just to the southwest of the Tri-State. No threat to the area right now. Will continue to monitor as well and the potential for flooding, heavy rain totals are expected by Thursday night . 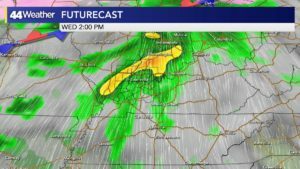 Totals could range anywhere from 2-4″ with locally higher amounts of 5″ to 6″ . 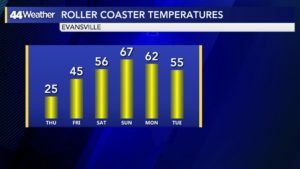 Temperatures plunge Thursday night – Friday. FRIDAY: Winter returns, will likely hit our highs just after midnight in the upper 30s to low 40s, but by Friday afternoon temperatures are in the upper 20s to low 30s under sunny skies.